Ming Tsai, chef at Blue Ginger, has a cooking show on PBS in which he presents his “east meets west” approach to his food. On a recent show he explored the pairing of maitake mushrooms and Worcestershire sauce, then invited chef Tony Maws of Craigie on Main to present a dish made with the two ingredients. Maws posted the recipe on his blog, which gave me the opportunity to try it myself. 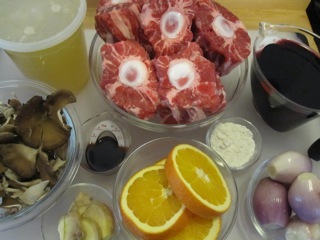 I started with four pounds of cut oxtails, a navel orange sliced into half-inch rounds, three thick slices of ginger (smashed), six whole peeled shallots, a third of a pound of maitake mushrooms,two tablespoons of Worcestershire sauce, two cups of red wine, and some flour. 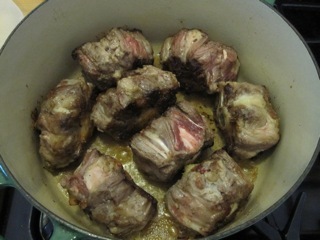 I salt and peppered the oxtails, sprinkled them with flour, then browned them on all sides on two tablespoons of canola oil. 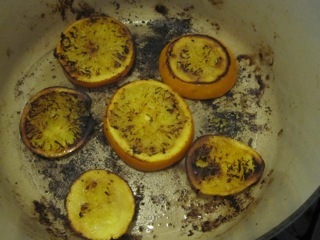 I removed the oxtails, wiped the pan clean, added more oil, and roasted the orange slices until they were caramelized. 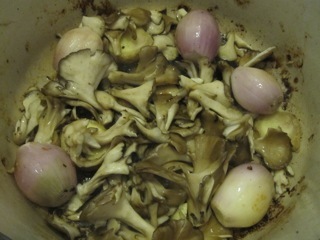 I removed the oranges, added a bit more oil, and roasted the shallots, mushrooms, and ginger until they began to soften. Although it’s not in the recipe, on the show Maws added a Thai bird chile to the pan. I didn’t have a fresh Thais pepper, so I tossed in two dried piquin chiles. I deglazed the pan with the wine and Worcestershire (the Brits make this easier and call it “Wooster sauce”) and reduced by half. 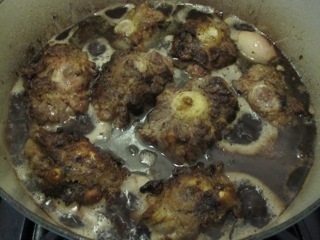 I returned the oxtails and oranges to the pot and added enough chicken stock to come halfway up the oxtails. I brought the pot to a simmer, covered it, and placed it in a 300 °F oven for three hours. 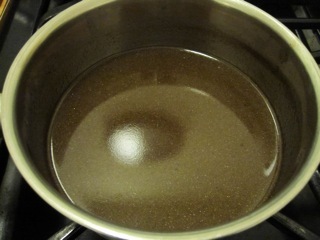 I strained off the sauce and reduced it until it was thickened. 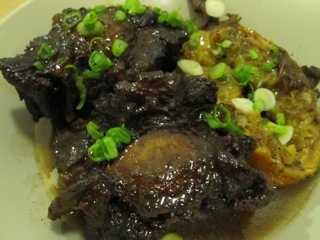 I served the oxtails with the orange slices and vegetables, added the sauce, and garnished with chopped scallions. Sometimes Ming’s combinations can feel a but contrived, but the one-two umami punch of the mushrooms and Worcestershire added even more meatiness to the oxtail. The ginger and orange contributed enough brightness and acidity to balance the rich beef, and the heat from the chiles crept in at the end. 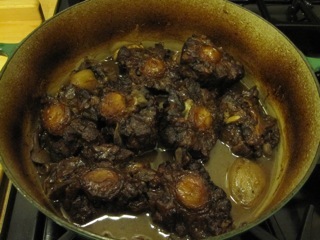 I know, another week, another braised dish. When am I going to get off this kick? Given the weather we’ve been having, it could be a while.